Playing Music in Your Business? You put everything you have into running your business and making sure your customers are happy. You’re an expert at what you do—so how are you supposed to know the licensing and royalty requirements for playing music in a commercial setting? While it’s easy to assume that plugging in an iPod or playing music from a computer is okay, it can actually put your business at risk of major fines for copyright infringement. 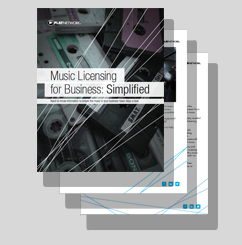 This is your need-to-know guide for enhancing your business setting with music. Even if you haven’t received a letter from ASCAP, a visit from BMI, or a phone call from SESAC, being proactive about music licensing for your business can not only keep you from legal ramifications and fines, but also save you large amounts of money on a monthly basis. Why is business licensing different than consumer licensing? What are the different types of licenses required? Whom do the rules apply to? What happens if I don’t have proper licensing? What can I do to ensure my music is properly licensed?